With Sellsy, you can send your documents with one click. No need to save it as a PDF, open it in your separate email provider, and write a message. Our way is much easier. Tip: You can choose to re-direct all your emails to Sellsy. In this case, complementary configurations are necessary (More information HERE). A window will open to send the email. It is very similar to a conventional email provider. You can also enter a new email recipient. The subject and message fields are completely editable, just as they are with your regular email provider. Your documents will be automatically transferred to PDF format and attached to the email. You can add any other attachments to your email. 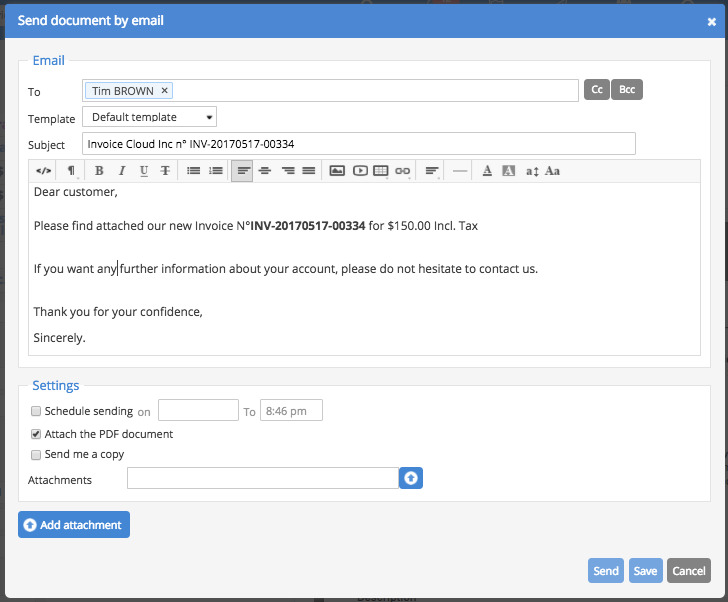 You can also choose to automatically attach documents to each message, such as your Terms of Sale. This feature can be set in the Briefcase tab. Any single attachment can be added by clicking the Add attachment button. Tip: You can drag-and-drop a file from your computer. To send your document immediately, click Send. You can also schedule it for later.